New YAMAHA Standard Alto Sax YAS-480 with Case Mouthpiece Neck From JAPAN. 75.6 x 39.8 x 24.4cm. Case ASC-400Ell, mouthpiece AS-4C, Neck for the AS-480. 62 style octave contact bars adoption. The item "New YAMAHA Standard Alto Sax YAS-480 with Case Mouthpiece Neck From JAPAN" is in sale since Friday, December 23, 2016. 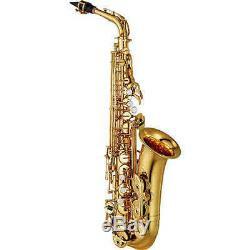 This item is in the category "Musical Instruments & Gear\Wind & Woodwind\Band & Orchestral\Saxophones".r-japan" and is located in Japan. This item can be shipped worldwide.